The policy threatens to leave the world short of oil and rob Americans of the gasoline price relief they usually get in the fall, just as they're preparing to vote in midterm elections. Donald Trump, president and chief executive officer of Trump Organization Inc. and 2016 Republican presidential candidate, speaks during a Tea Party Patriots rally against the Iran nuclear deal on Capitol Hill in Washington, D.C., U.S., on Wednesday, Sept. 9, 2015. The Trump administration's effort to punish Iran by swiftly curtailing that nation's energy exports is undermining its goal of preventing oil prices from rising ahead of midterm elections. That policy now threatens to leave the world with a shortage of crude and rob Americans of the gasoline price relief they usually get in the autumn. It may even leave drivers paying more at filling stations in the fall, just as they're preparing to cast their votes in elections that could hand Democrats control of the House. Americans are already seeing their gas bills rise after enjoying years of low costs thanks to an historic downturn in oil prices. U.S. gasoline futures are up about 17.5 percent this year, and have risen nearly 38 percent since President Donald Trump took office. Trump appeared to get his way just over a week ago when two dozen oil producers agreed to pump more crude to tame rising oil prices. Worried that Trump's sanctions on Iranian oil exports would cause Americans pain at the gas pump, his administration reportedly lobbied Saudi Arabia for the hike. But just days after OPEC announced its decision, the State Department sent oil prices soaring by announcing a policy that threatens to wipe out much of Iran's crude exports in the coming months. By Saturday, Trump was tweeting that he'd asked Saudi Arabia's king to raise output by up to 2 million barrels per day (bpd) — double what the Saudis and their allies agreed to the previous week. The White House later walked back Trump's claim on Twitter that King Salman bin Abdulaziz Al Saud agreed to his request, and analysts are uncertain the Saudis can deliver. Making matters more difficult, the Trump administration has imposed a deadline on oil buyers to cut off purchases from Iran by Nov. 4, just two days before most Americans vote. 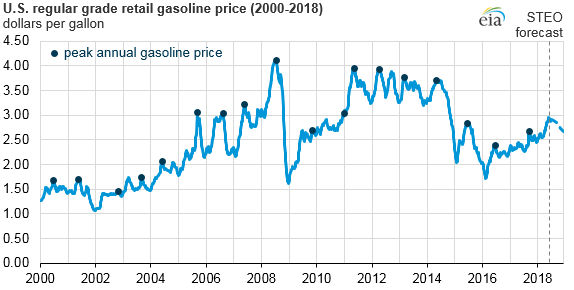 To be sure, it remains unclear to what extent higher gasoline prices would hurt Republicans at the polls, or whether voters will connect Trump's policies to gas costs. However, the threat of elevated fuel prices comes as U.S. trade disputes with its biggest trading partners risk putting upward pressure on consumer prices and denting Americans' view of the economy. The recovery accelerated ahead of Trump's decision in May to abandon the 2015 Iran nuclear deal and restore sanctions on the country. The cost of oil has surged more than 14 percent over the last three months, with international benchmark Brent crude racking up its biggest quarterly gain in nearly six years and U.S. crude posting its best quarter in two years. "If we're going to go through with this strategy, if we are clearly intent on taking a million and half, 2 million Iranian barrels off the market, that's what we have to reconcile ourselves to," she told CNBC's "Power Lunch" on Friday. President Barack Obama started his two terms with oil prices near multi-year lows struck during the economic crisis. U.S. crude then traded between roughly $75-$115 a barrel from 2010 until 2014, when the market crashed after OPEC refused to cut production to drain a global crude glut. During Obama's final year in office, prices rallied from $26 to about $60 after OPEC finally orchestrated output cuts in partnership with top oil producer Russia. OPEC, Russia and several other producers are now aiming to increase output by about 1 million bpd. However, analysts are skeptical they'll meet that target and say the market can easily sop up the extra supply. At the same time, U.S. crude output is rising, but labor shortages and pipeline bottlenecks in the nation's biggest oil field are capping growth. Given those obstacles, crude oil prices could rise enough to offset the seasonal decline in gasoline prices that Americans usually enjoy in the autumn, said Andrew Lipow, president of Lipow Oil Associates. OPEC's next official meeting isn't until Dec. 3, though the group is expected to review market conditions in September at a special gathering announced last month. The Saudis would face the challenge of persuading OPEC members like Iran and Venezuela, which opposed a production hike last month.